Being a prominent Manufacturer, Exporter & Supplier in the industry, we present a wide range of Twin Head Perfume Filling Machine to our customers. The quality we offer is unmatched. We take special care of quality by testing the machine against the highest parameters of quality set by the industry. We provide the machine in safe packaging at affordable rates. We also deliver at your doorstep at your ease owing to our first-rate distribution system. Twin Head Vacuum Assisted Perfume Filling Machine we manufacture are versatile filling machine for volume filling applications mostly in Perfume Industries where the volume of filling is important. 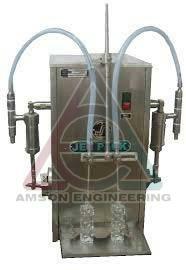 Very useful filling machine designed for perfume industries. Here, the machine works on the basis of air removal from glass or hard bottles using Vacuum suction from the bottle and liquid filling inside. Fast filling of any Glass bottles can be done by using this machine. Various volume can be filled by adjusting the height of Bottle holder and by adjusting the vacuum filling nozzle. All product contact parts are made of stainless steel 304 quality. No dripping or wastage of liquids because of vacuum and trap vessel. Bottle resting platform with height adjusting facility for Nozzles. Any volume can be filled from 2ml to 200ml as per required according to nozzle depth inside the bottle. Machine weight - 80 kgs. Approx. Gross Weight including Packing - 110 kg. Machine name - Twin Head Vacuum filling Machine. Output - 15 fills per minute from each head @100ml. Power consumption - 0.3 KwH. Electricity required - 1 phase 220 VAC. 50 Hz. Vacuum pump - 1/4HP 75 LPM, oil cooled/Air cooled, MINIVAC make. 10 liter capacity overflow stainless steel vessel attached. Fill capacity from 2ml to 200ml.